Our goal is to help others get into safe & sound homes without unforseen surprises ! Buying a home is probably the largest single investment you will ever make. You should learn as much as you can about the property and the need of any major reparis before you buy so you can minimize any unpleasant surprises and difficulities afterwards. The cost of a home inspection is very small relative to the home being inspected.We are determined to perform inspections of the upmost quality, with integrity. For a buyer, we make sure that they know and understand every fact about the property that they are purchasing. For sellers, we will provide a report that gives you peace of mind or a heads up on what the buyer may be asking to be repaired ahead of time. As your home inspector I will use my experience to educate my clients about their purchase. There is no "pass" or "fail" in a home inspection. An inspection is not an appraisal. We do not determine value of a home. When I am hired to inspect a home or a commercial property I am there for just one reason- to investigate the property and develop a report to educate my clients on their purchase. I do this by using years of construction knowledge, constant training, and up to date equipment to evaluate the property. 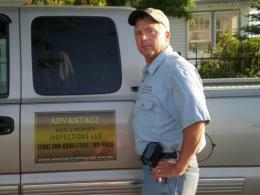 I am also a member of the National Association of Certified Home Inspectors. Anytime that you are purchasing a property, I understand that it is a HUGE investment. Everyone involved needs to know every aspect of the property. I take pride in providing this service. The majority of my business is from client referrals and from real estate agent recommendations. I work directly for the client. My job is to insure that the client understands every item that may be reported. My job does not end after the report is completed. Should you have any questions months down the road, you are encouraged to give me a call. I will act as your consultant as long as you own the property. As long as you know it's a lemon"